Guest blogger Josh Metten is a Senior Naturalist with Jackson Hole EcoTour Adventures with nearly a decade of experience guiding and sharing stories about the Greater Yellowstone Ecosystem. Thank you, Josh, for all you do for Greater Yellowstone. The Bechler pack has chosen an unusual area to make a living, prey are limited but so is competition from other packs. They’re too remote for the intensive study which occurs on other packs and so each year biologists set up trail cameras in hopes of getting a few glimpses into the lives of these apex predators. We reach the camera, still fixed to a snag where Kira and her sister Brenna, also a biologist with the park, left it months before. “Trail cameras are like opening a wrapped present, you have no idea what might be inside” Kira says as we flip through over 800 photos from the past year. A black bear walks through the camera, then a moose, a fox, sandhill cranes, and a red pine squirrel. We laugh with excitement when the first image of a wolf appears. The black wolf, with a graying muzzle and yellow eyes, curiously stares straight into the camera. 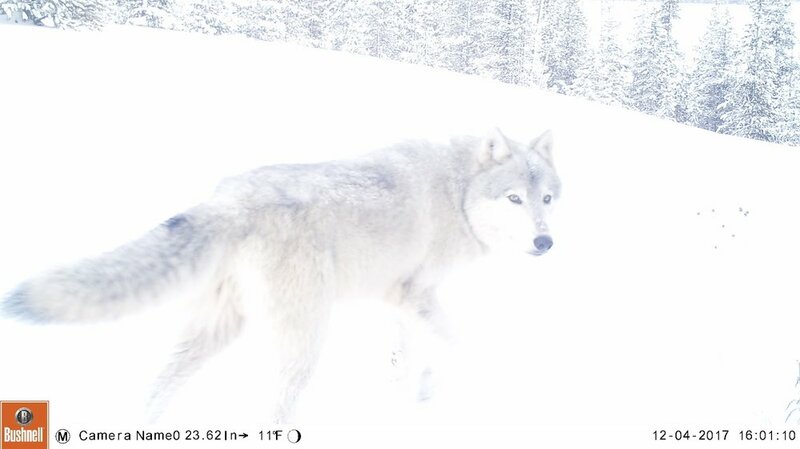 A few photos (and weeks) later a gray wolf strolls through, looking back at the camera. It’s followed by a beautiful white wolf. The Bechler pack, it seems, is alive and well. Once widespread across North America and other parts of the globe, wolves are skilled at adapting to the dynamic world around them. Even with centuries of human persecution wolves have continued to persist across parts of their historic range. However, coordinated efforts throughout the 1800’s led to mass eradication, by the early 1900’s wolves had disappeared from much of the continental US, including Yellowstone National Park. In the 1970’s a wave of environmental enthusiasm swept across the country, including bipartisan passage of the Endangered Species Act. This overwhelmingly popular bill received a unanimous vote in the Senate and 390-12 vote in the House, recognizing our moral and legal obligation to prevent human-caused extinction of other species. With passage of the act, reintroduction in Yellowstone was a logical step. The 2.5 million acres of national parks and over 11 million acres of surrounding national forest of the Greater Yellowstone Ecosystem contains the large intact landscapes and massive herds of elk wolves need to thrive. And Yellowstone, at the core of the ecosystem, would be the living laboratory for scientists and the public to observe the return of a long lost apex predator. Each year, for 30 days from mid-November to mid-December and again in the month of March, winter study crews arrive at the Yellowstone Center for Resources in Mammoth to observe and document wolf behavior. This long term study, coordinated by the Yellowstone Wolf Project and National Park Service, has been going on since reintroduction 23 years ago. Each crew is assigned a different pack, following them from first light until dark. GPS collars on some of the wolves report hourly location fixes, beamed to a satellite every four, aiding in the monitoring of the packs. But much of the crew’s time is spent gazing through spotting scopes, staring at little dots in the distance, jotting down behavioral observations as they occur. Other crews identify potential carcass locations by clustered GPS points, visiting them after the wolves have departed to identify and study the remains. The volumes of data collected over the last 23 years are just beginning tell us the story of the return of wolves to Yellowstone. Wolves, and their predation and interactions with herbivores like elk are changing rivers in some areas of the park. The impact is less pronounced in others. They’ve attracted a dedicated following of wildlife enthusiasts, estimated at over 150,000 annually who visit the park with the express intention of seeing a wild wolf. Come join us this winter on a wolf and wildlife multi day safari in January or February! But it may be what we’ve learned about the social nature of wolves and how that relates to other species including humans which is the most significant. In her Master’s work on Yellowstone wolves, Kira looked at pack aggression, what happens when two packs interact. Often these highly territorial animals fight, being killed by another wolf is the leading cause of death in Yellowstone. As she analyzed over a decade of data on wolf interactions Kira expected packs with the strongest wolves, younger adults in their prime to be the biggest factor in pack survival. Though important, the most significant variable in all of her tests were the elders, wolves over 6 years old. The wisdom of these experienced wolves guide the packs to success, whether in a battle over territory, hunting, or otherwise adapting to the landscape they depend upon. Wildlife biologists see the same importance of elders in other social animals across the planet. Post reproductive female orcas are relied upon by the pod to find salmon runs in thin times. In extreme drought, elephant matriarchs remember waterholes from 50 years prior. Old wolves guide their packs to success, knowing when to fight, and when to run. Aldo Leopold’s famous quote, written in the 1930’s is a reflection of the idea that living laboratories like Yellowstone have lessons to share with us if we are willing to patiently observe and listen. When we let a species like wolves disappear from the landscape that voice, and it’s wisdom, falls silent. The return of wolves to the Greater Yellowstone Ecosystem is the return of ancient knowledge, and a missing cog integral this wild landscape. Want to observe and learn about Yellowstone’s wolves and wildlife this winter? Join us on our Winter Wolf and Wildlife Multi Day Tour. We’re donating 5% of the trip to our friends at the Greater Yellowstone Coalition for wolf and wildlife conservation. Now in our 11th year of operation, Jackson Hole Ecotour Adventures leads wildlife safaris, cross country skiing tours, and snowshoe tours in Grand Teton and Yellowstone National Parks 365 days a year. Let us help maximize your Jackson Hole Experience Today!